In 2016, global wood pellet consumption reached 27,8 million tonnes and observed a growth of 6%. Responsible for almost 80% of the world’s wood pellet consumption with 21,7 million tonnes, Europe (mainly the EU28) remained a massive pellet consumer. 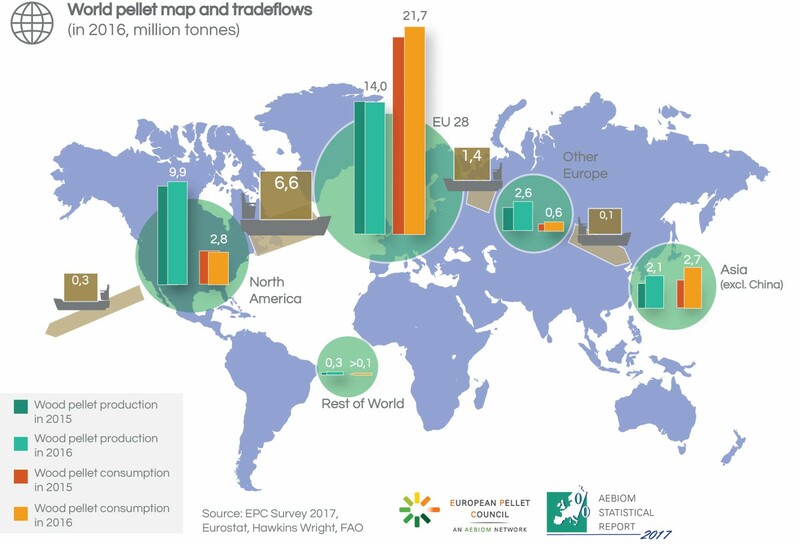 The overall growth of pellet consumption in Europe has been close to 5% from 2015 to 2016, which is much lower than the 13% increase recorded during the previous period (2014-2015). With a production volume of 16,6 million tonnes (14 million for the EU28), Europe supplies 74% of its pellet use (65% for EU28).